Double sided, polyethylene core tape for mounting and attaching without the need for screws, bolts or other mechanical fasteners. Provides consistent reliable bonding even in applications with irregular surfaces. 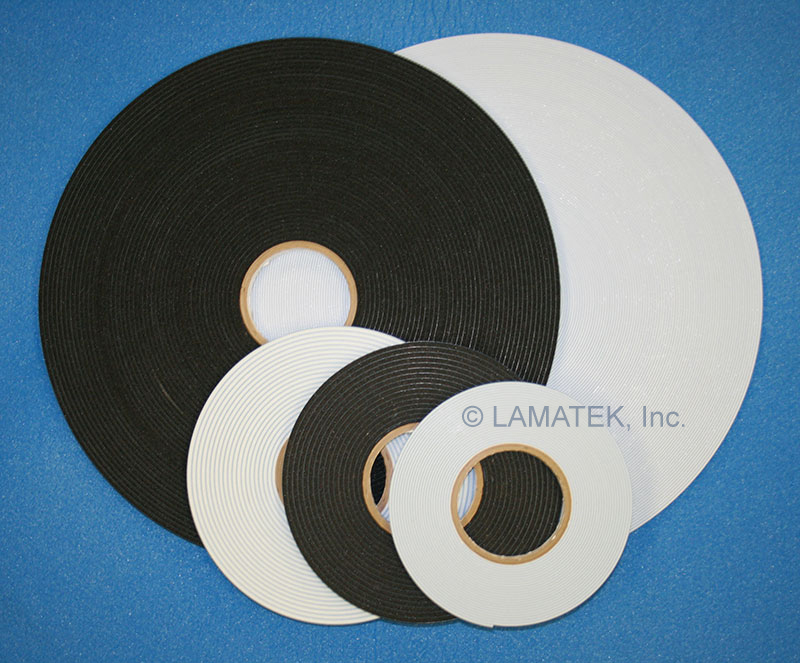 SureMount mounting tape products are applied using a simple peel-and-stick adhesive backing. Tapes are provided with adhesive on both sides, but a release liner on one side. This way the tape can be peeled from the roll and stuck to once surface. Then remove the liner(s) and adhere the item to your wall or secondary surface. Die cut SureMount products are provided kiss-cut in rolls with a liner on both sides. Simply peel the dot or gasket from the paper and apply. Then remove the second liner for mounting. SureMount tapes are available in cut to width rolls, continuous spools for long run processes, and custom cut double sided pieces like squares or dots. All SureMount products are manufactured using a closed cell, fully cross-linked polyethylene foam with an adhesive designed to meet your physical requirements. Rubber based adhesive tape designed for indoor applications or light mounting applications that do not involve UV exposure. Available in white or black foam with a bleach white paper release liner. More advanced acrylic adhesive provides excellent bonding strength for extended time periods and in applications with moderate UV exposure. Provides a higher shear and tensile strength than SureMount SM. Available in white or black foam with a blue poly release liner. When your application requires extreme bonding strengths, extended UV exposure or water resistance, SureMount EM is there. Available in light grey, charcoal or black with an unbleached paper release liner.